The ulnar collateral ligament (UCL) is one of the main stabilizing ligaments in the elbow and is involved especially with overhead activities such as throwing and pitching. 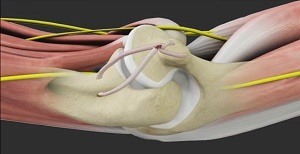 When this ligament is injured it can end a professional athlete’s career unless surgery is performed. The first surgery to repair a UCL injury was performed in 1974 to Tommy John, a famous pitcher at that time. As a result, you may hear the term “Tommy John Surgery” when discussing UCL reconstruction surgery. Your physician will confirm the diagnosis of UCL insufficiency by collecting medical history, performing a physical examination and diagnostic tests such as X-rays or MRI scans.